Parsons or any other college of art and. or Interior Design here at Parsons. TODAY CREATIVITY IS TRANSFORMING EVERYTHING. FIND YOUR VOICE, YOUR community, YOUR PATH TO CHANGE AT PARSONS. School for Art and Design in the United States and ranked second in the world1—has offered innovative approaches to education since its founding in 1896. Today we’re the only major American art and design school within a comprehensive university, The New School, which also houses a rigorous liberal arts college, a progressive performing arts school, a legendary graduate school, and other programs. Here you can master established creative practices or advance emerging ones on a campus that immerses you in an environment of interdisciplinary inquiry. Surrounded by fresh perspectives and the university’s extensive resources, you research and create in broader, deeper, and more forward-looking ways. And guided by Parsons faculty, you produce work that reflects human needs and responds to the call for innovation and change. Through creative and critical thought and action, you work to improve the world by design. By Quacquarelli Symonds World University Rankings (2018), a London-based global provider of specialist higher education and career information. Ranking based on feedback from both academic peers and employers. Your Future, in Focus Pursue the career you want—in graphic design, fashion design, fashion marketing and communication, or interior design—with an Associate in Applied Science (AAS) degree from Parsons School of Design in New York City. It takes commitment and hard work, but you leave the program prepared for a new professional life, with the skills, perspectives, and relationships you need to thrive in and lead global creative industries. Whether you’re coming to Parsons’ AAS program as an attorney, dancer, banker, healthcare worker, or chef, you are passionate about entering a creative industry. You’re joining the AAS community to learn alongside experienced professionals establishing new careers at a world-class art and design university in a cultural capital. While acquiring the skills to become a merchandiser, graphic artist, fashion designer, interior designer, trend forecaster, or design PR officer or consultant, you’ll discover that many of the talents and abilities you developed in other fields complement your studies. The AAS educational approach builds on this expertise, making you sought after for your marketable combination of academic and professional experience. As you embark on a new path, you’ll see your professional future coming into focus. An Intensive, Flexible Curriculum Parsons’ AAS degrees are intensive programs designed for mature students who want to pursue a new career. AAS students benefit from the same resources as bachelor’s and master’s students enrolled throughout The New School. Applicants are required to have college experience or a minimum of two years of professional experience. Most AAS students have bachelor’s or advanced degrees, but even if you have no transferable credits, you can earn an AAS degree in two years. (If you are a current or recently graduated high school student, consider our bachelor’s degree programs.) Working professionals can study part-time. In addition, many classes are offered in the evening, and elective options across the university are offered both on-site and online. Most students with some eligible transfer credit finish the program in about three semesters of full-time study. Students who receive the maximum number of appropriate transfer credits may qualify for the fast-track option and earn a degree in two semesters. For complete curriculum and course information, visit newschool.edu/aas. In addition to its AAS curricula, Parsons offers a variety of bachelor’s and master’s degree programs. If you have questions or want to discuss options based on your interests and goals, email us: thinkparsonsAAS@newschool.edu. builds community among students and faculty in related disciplines. programs are best suited to students with college experience who are clear about their interests in the field of design and prepared for rapid immersion in a professional course of study. Our students enter the school as experienced attorneys, bankers, teachers, stockbrokers, and chefs. When they graduate from Parsons, they are merchandisers, fashion designers, graphic artists, and interior designers versed in the language, process, and technology of their new fields. gate. The program’s reputation for quality, industry relevance, originality, and comprehensiveness opens doors throughout the fashion industry. Refining Your Vision The program provides opportunities to have your final body of work showcased and photographed, giving you documentary portfolio material. Your work is promoted on a variety of platforms, and selected work is presented during the annual Parsons Festival. Your design practice is developed under the guidance of Parsons’ faculty of fashion professionals and reflects an awareness of the industry’s social, historical, and economic dimensions. TOP RIGHT, TOP LEFT: Xianyang Zhang ’18, Research_Tech+Fashion+Design MIDDLE: Anna Shen ’18, sketches BOTTOM: This series of process sketches, by Katrina Larida ’18, highlights the design details of a garment of transparent fabric that is folded and draped into an elegant silhouette. finish the program in about three semesters. and wearable separates to women everywhere. refined his vision and deepened his mastery of the craft. “It was a crucial time for me in my career,” says Gurung. Gurung has collaborated with some of fashion’s most popular brands, including J.Crew, Target, and MAC Cosmetics. His work is currently featured in WWD, Farfetch, Vogue, and other top fashion media outlets. Fashion Marketing AND COMMUNICATION AAS Fashion Marketing and Communication at Parsons is an intensive, flexible program centering on the fundamentals of communication strategy. You will explore the relationship between brand, product, and audience and the role of marketing and communication practices within wider fashion systems. You will learn about trend, visual, and consumer research and gain skills in interpreting data to extract insights. The program develops students who can identify and distill social, cultural, and economic trends and attitudes and influence discourse on topics such as gender, race, consumption, and well-being. Taught by working professionals, the curriculum reflects the evolving industry and the forces that shape it. bring innovative solutions, products, and systems to the global stage. brands. Students learn the fundamentals of communication strategy and how to develop a written, visual, and digital narrative. Electives allow you to specialize in an area of fashion communication, and courses shared with the AAS Fashion Design program prepare you to think creatively and conscientiously about the current status of the fashion industry. Internships develop your skills and network, making you a competitive member of the fashion workforce. You can complete your degree in two to four semesters of full-time study, depending on the number of transfer credits you bring to your AAS program. Most students finish the program in about three semesters. For more curriculum, faculty, and course information, visit newschool.edu/aas. for the Vicious Recordings music label. The program was then called AAS Fashion Marketing. planning. An AAS-organized competition to develop a lifestyle collection for Under Armour was part of her career preparation as well. After Tham and a BFA Fashion Design collaborator won the contest, they entered an intensive fashion design and merchandising mentoring program at Under Armour’s headquarters. An internship at Donna Karan helped Tham land a job as a merchandise planner on Karan’s team immediately after her graduation from Parsons. According to Tham, “The program opened doors to the fashion industry. Parsons provided a strong support network and exposed me to opportunities in a fiercely competitive market.” Now, after returning to her home country, Tham is directing operations for Canadian luxury fashion retailer BLU’s Womens Wear. The program was then called AAS Fashion Marketing. card designs produced for a fundraiser sponsored by AID FOR AIDS International and Marc Jacobs Inc. Your Education: Broad, Deep, and Rigorous The field of graphic design is broad and deep, so your education is, too. Rigorous and intensive, the AAS curriculum presents the historical foundations of graphic design, instructs you in conceptual approaches and transdisciplinary methods of addressing design challenges, and provides training in industry software and other digital and nondigital tools, including ones found throughout the Making Center network (see page 50). You learn to design for print and the Internet, exploring typography, publication design for print and the Web, and interaction design as well as advanced topics like editorial design, branding, digital product design, and advertising design. Assignments mirror real-world graphic design challenges and become part of your professional portfolio. Visiting lecturers like graphic design blogger Tina Roth-Eisenberg (swissmiss.com) and cognitive psychologist Alan Gilchrist bring fresh perspectives into the classroom. Internships, which can lead to employment after graduation, let you apply your learning and engage with industry professionals as you prepare to join the creative workforce anywhere in the world. Curriculum You can complete your degree in two to four semesters of full-time study, depending on the number of transfer credits you bring to your AAS program. Most students finish the program in about three semesters. For more curriculum, faculty, and course information, visit newschool.edu/aas. SkillShare, J.Crew/Madewell, Herb Lester Associates, and Friends of Type and works on his own projects. VP of Digital Creative Esteé Lauder After earning a BA in modern European history at Barnard College, Janice Yu Veksler discovered an interest in graphic design while assisting the art editor at the New Yorker. After four years at the magazine, Veksler decided to get a formal education in graphic design at Parsons. She began her design career as art director of zingmagazine and went on to serve as a senior designer at Visionaire and then as an art director at Teen Vogue. Veksler served as Web art director at Kate Spade and is currently vice president of digital creative for Esteé Lauder. “My experience in the AAS program was invaluable; I built a strong portfolio, essential to getting my now,” says Veksler. Distillery Marketing + Design, a multiplatform design firm serving an array of national clients from its Madison, Wisconsin, headquarters. In 1906, Frank Alvah Parsons established the first academic interior design program in the United States. 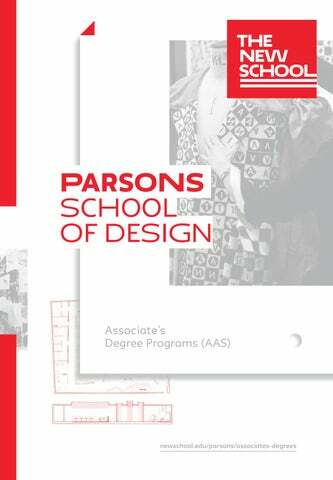 Parsons continues to lead this evolving field with programs including AAS Interior Design. Begin your career with accomplished New York interior design professionals who guide you in exploring the potential of design to improve lives at every scale. You develop an awareness of the social, environmental, and cultural dimensions of interiors through curricula and projects that investigate global concerns such as sustainability and economic inequality. In the process, you become a designer equipped with the knowledge, skills, and networks needed to succeed in a growing field. experts that make the city an international center of interior design. Curriculum Electives enable you to deepen your understanding of and experience designing with soft and hard materials, lighting systems, and sustainable and other professional practices; explore graphic design and illustration techniques applicable to interior design; and study a range of historical and theoretical topics. You can complete your degree in two to four semesters of full-time study, depending on the number of transfer credits you bring to your AAS program. Most students finish the program in about three semesters. For more curriculum, faculty, and course information, visit newschool.edu/aas. their 15-member team bring a high-end residential design approach to projects for hospitality, retail, commercial, and residential clients like Tiffany & Co., Victoria’s Secret, and The Arman apartment complex. GRADE New York has also extended the firm’s line to include furniture and other product development. Yedid’s work is regularly profiled in New York City–based and international online and print publications, including The Aesthete, Lifestyle Mirror, and the New York Times. brands such as the Four Seasons and up-and-coming brands such as Moxy and Equinox. In the spring of 2015, Meersseman returned to Parsons as a part-time lecturer. design fields and enhance urban life. changes to reach that goal. find support resources, including aid. accommodations. Learn more about housing options at newschool.edu/housing. 1 Please note that students must have graduated from high school at least two years before entering the AAS program. If you are a current or recently graduated high school student, consider applying to a bachelorâ&#x20AC;&#x2122;s degree program. Located in Greenwich Village, in the heart of NYC, with a branch campus in Paris. Houses five schools and colleges. Offers more than 130 degree and diploma programs and majors and more than 50 minors. Has more than 10,000 degree-seeking students. Students come from all 50 states and 116 countries. #1 for sustainable building The American Institute of Architects named the New School University Center one of the greenest buildings in the United States—and it’s the largest LEED (Leadership in Energy and Environmental Design) Gold–certified urban university building. For full information on the university’s accreditation, visit newschool.edu/provost/ accreditation. irrevocable contract between the student and The New School. The university reserves the right to change without notice any matter contained in this publication, including but not limited to tuition, fees, policies, degrees, programs, names of programs, course offerings, academic activities, academic requirements, facilities, faculty, and administrators. Payment of tuition or attendance at any classes shall constitute a student’s acceptance of the administration’s rights as set forth above. The New School is an Affirmative Action/Equal Opportunity Institution. 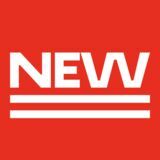 For important information including student rights, campus safety statistics, and tuition and fees, visit newschool.edu/your-right-to-know. Published 2018 by The New School. Produced by Marketing and Communication, The New School. The New School is accredited by the Middle States Commission on Higher Education. MSCHE is a regional accreditor and federally recognized body. The New School has been accredited by MSCHE since 1960. All degree programs at the New York City campus of The New School are registered by the New York State Department of Education. Both NYSED and MSCHE provide assurance to students, parents, and all stakeholders that The New School meets clear quality standards for educational and financial performance. You are here, with new information and an invitation to join Parsonsâ&#x20AC;&#x2122; learning community. Our university is a creative, stimulating, and diverse environment catalyzing action and new ideas on campus and beyond. A space in which to explore, investigate, and address global challenges. No silos. No prescribed paths. Just extraordinary possibility. Talk to us. We are here to provide more information, answer questions, and introduce you to a unique path of academic excellence. This brochure is printed on 100 percent post-consumer recycled paper with UV inks that conserve energy and material and do not release VOCs into the atmosphereâ&#x20AC;&#x201D; reflecting the university's embrace of environmental responsibility. Hand it over to a friend.